Warren Tales is double-dipping in creativity for the production of my new poetry chapbook! Author Bio: Lindsey Yuriko Warriner is a shepherd of short poetry. She draws inspiration from her international upbringing, and dreams of one day writing an epic poem. 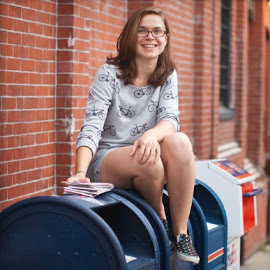 She has been published by Alehouse Press, and was awarded the 2010 Evvy for Outstanding Poetry by Emerson College, where she earned her BFA in Writing, Literature, and Publishing. Small City is a collection of short poems ranging in tone from whimsical, reflective, and socially curious. This chapbook was greatly inspired by the city of Boston and demonstrates this in a unique paper-cut depiction of the metropolitan downtown area, featured on the cover and title page. The book measures 4 1/2 x 4 1/2 inches, and has been hand-bound with a tabbed "matchbook" saddle binding. Each copy is numbered one through thirty out of thirty in this first edition print run. Please see below for an example of two of the twenty-nine poems featured in the book, and contact warrentales@gmail.com with any further questions or supply inquiries. Orders will be purchased through Etsy. days passed without a concept of days. hour of expulsion. We've come, now let us in. 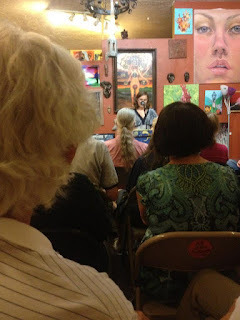 My book release and first reading feature took place this Monday as a part of the Stone Soup evening at the Out of the Blue Gallery in Cambridge, to a great reception—a studio packed full of friends, fellow poets, and long-time Stone Soup patrons. I read a selection of original poetry for twenty-five minutes, and not only didn't trip over my own words (or feet), but actually felt very comfortable up in front of the mic. And sold 8 copies of Small City (18 including online reservations). Take that, childhood jitters! Thank you to Michael F. Gill for the booking, and for being a fabulous host.